Bedroom Organisation Made Easy - Home Sorted! Is your bedroom constantly disorganised? Perhaps, you struggle to make sense of all your belongings and the small thought of keeping ‘everything in its place’ is simply too much. 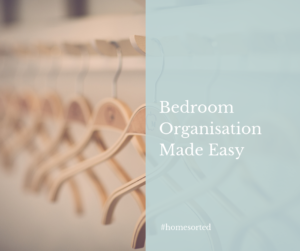 If you find yourself nodding along to either scenario, it may be time to rethink your current strategy and figure out your bedroom organisation once and for all. If your bedroom is of the smaller side (a very common occurrence in modern homes) it’s incredibly important to take advantage of as many storage solutions as possible. We recommend utilising under bed storage for items you don’t use frequently, but also need easy access to should the need arise. This could include seasonal clothing like coats (stored in vacuum seal bags), spare shoes, handbags, and even items like books and photo albums. Slim containers that can be pulled in and out from beneath the bed are perfect for this! 3. Hang and fold items by type and size – this means grouping similar items together. For example, in the hanging space of your wardrobe start by hanging coats, then dresses, pants, skirts and finally tops. 4. Don’t forget about your accessories and shoes – this can be countered for with hooks inside of your wardrobe doors, extra shelves, or a shoe rack that sits beneath your hanging clothes. The main point to remember is that you should be able to see everything you own with your wardrobe doors open. Another simple strategy for bedroom organisation is to purchase furniture with inbuilt storage. We particularly love bedside tables that have drawers where you can store odds and ends out of sight. Baskets can also fall in this category as they’re great for storing pillows and blankets when they’re not in use – they look fantastic too! Do you have a bedroom organisation trick? Jump on our Facebook page and tell us all about it.